Japan's government is extending significant financial assistance to encourage the development of low-cost nursing care robots. A motorized robot suit that can assist in lifting or moving elderly and otherwise impaired patients so that caretakers do not need to exert as much physical strength. An ambulatory robot that can help the elderly and others walk by themselves, even on inclines. A portable, self-cleaning robot toilet that can be placed in living rooms or bedrooms to make using the toilet easier for the e lderly and others. A monitoring robot that can track the movements and whereabouts of dementia patients. Starting this fiscal year, the government is providing subsidies covering one-half to two-thirds of research and development costs to firms working on nursing care robots. Such subsidies are set to total 2.4 billion yen this fiscal year alone. Some companies have developed humanoid nursing care robots that can lift and hold patients. However, these cost as much as 20 million yen each and are not widely used. 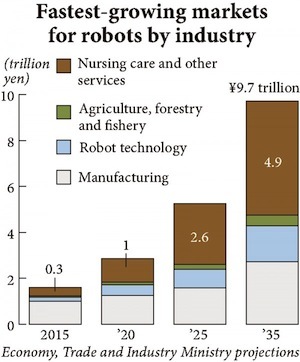 The government expects nursing care robots around the 100,000 yen price range to become commercialized by fiscal 2016 as a result of focused subsidies and mass production. The support will be a part of the government's efforts to stimulate the nation's economy.